Star Trek: The Next Generation Remastered On Blu-ray NEW SIDE-BY-SIDE COMPARISON VIDEO! As the title suggests, below is the most recent video released to showcase the HD treatment for the upcoming release of Star Trek: The Next Generation on Blu-ray. This is a sample of a few scenes from the TNG pilot, Encounter at Farpoint, with side-by-side comparisons of the original SD versions and the remastered HD versions. This episode, along with the episodes Sins of the Father and The Inner Light will be available on a three-episode Blu-ray sampler disc to be released on January 31st, called Star Trek: The Next Generation – The Next Level which can be pre-ordered on Amazon right now. As we’ve noted before, all seven season of the series will be released on Blu-ray with the first season due out later this year. As far as this latest video is concerned, we are shocked with just how amazing this looks. In fact, there are parts of this that just look too good. What caught our attention is… well… the dirt when the alien rises from the surface. The shot is so clean that there’s no room for your brain to suspend your disbelief. It literally looks like a bunch of dirt thrown down on a 10 foot by 10 foot diorama model on a soundstage as opposed to looking like a landscape of some exotic planet. This is more of an observation than anything else because in 1987 that level was detail was fine for an SD world where the ground looked fuzzy to begin with so it appeared to be as the model builders intended it. Not so much today. 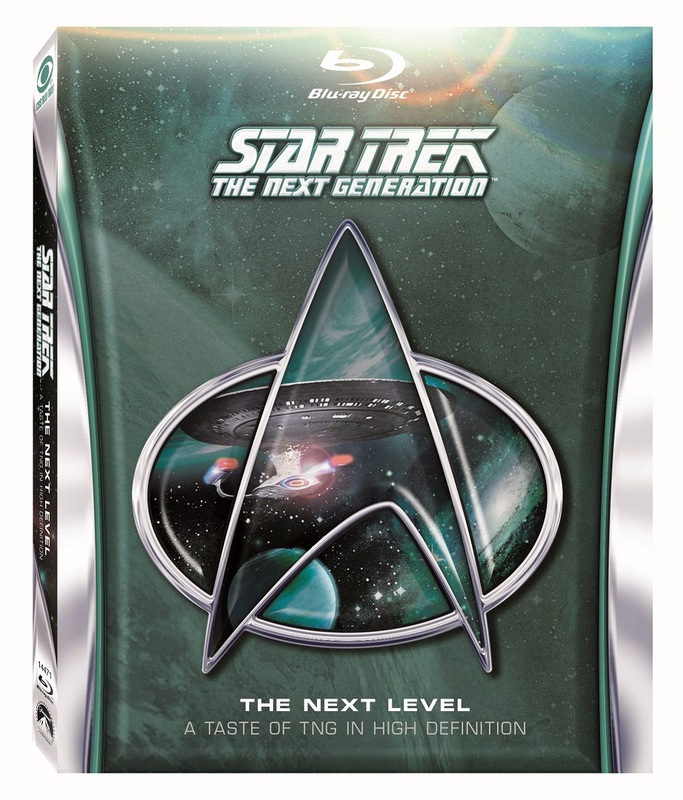 For more information on the upcoming Blu-ray release of TNG check out our piece, Star Trek: The Next Generation Remastered On Blu-ray in 2012. Press Release And Five Things You Should Know and the second trailer released, here. This entry was posted in GEEK ALERT!, TV NEWS and tagged blu-ray, hd, sci fi, science fiction, series, star trek, star trek: the next generation, television. Bookmark the permalink. 5 Responses to Star Trek: The Next Generation Remastered On Blu-ray NEW SIDE-BY-SIDE COMPARISON VIDEO! Agh, Shawn, how on earth – or in the Universe – could I afford to RE-BUY all seven shows in BR? It already KILLS me that the entire TNG is the price I paid for ONE SEASON when they first came out … remember those days? When each season was 150.00? Or, if you were lucky, you could get some decent discounts and maybe it cost 100.00…. While I think this looks INCREDIBLE, I personally, have been very pleased with the previous remastered series of TOS, and I believe that DS9/VOY, ENT came out in good releases to begin with. And I don’t ever remember the TNG uniforms looking FUCHSIA as in this side by side comparison. At least not on any TV I’ve seen it on. Perhaps they are stretching this a bit much — I don’t seem to recall the FX looking THAT bad in Farpoint, tho, I have been wrong (sadly, many times 😛 ). The trick to this is, Connie, is to buy your BD sets as they are released and sell your DVD sets on eBay (or, preferably Amazon). Unlike VHS, which was all but dead by 2002 when TNG was released on DVD, today, DVD is a format that is still very much alive and you can easily make few bucks back on your investment. Season One is still going for $24.00 used on Amazon. Also, the process for the manufacture of disc-based media, even BD has gotten so streamlined and efficient that I doubt that these sets will be more than $60 per per season, just as it was with TOS. CBS can’t price themselves out of the market because there is that recurring of “double-dipping” and consumer backlash over it. The key to this is that three-episode sampler that comes out at the end of the month. It’s $14.99 on Amazon and available for pre-order. I think this is a great idea because it gives us a chance to see whether or not it’s really worth it to upgrade to BD. I wish they had done that with Farscape which I am very disappointed in as I discovered that the entire series on BD is merely upconverted to 1080p from 480 SD videotape because the producers have no idea what happened to the original 35 mm negatives. If I had known this, I would never have bought the BD set because it literally looks like an upconverted DVD. The only reason that it doesn’t completely piss me off is that the show is fantastic and the audio quality is unreal. I think if I spend much more money on ST DVDs, I won’t have to worry about staying married 🙂 Please let us all know how it looks — and IF it looks like this side-by-side comparison. Having some doubts on that part…. For FARSCAPE…. I am SO glad I didn’t buy the BD version, after seeing what your wrote. About 3 yrs ago, maybe 2, I spent close to $300.00 to complete my SD set. This was after they’d stopped distribution, and while I’d gotten my first season, didn’t have the other three. About one month after I finished buying all three seasons, the darn thing came out in one boxed set for less than $100.00. OUCH! Yup, I bought it, and still have all those other versions, which I haven’t watched yet. Have some of the STARBURST editions, so will be interested in seeing if there is any difference in those (in SD for all those sets). I was tempted about the BD version, but again, after spending far too much to finally own the darn full series, decided needed to spend money on the outrageous heating oil instead…. Dammit, Connie if I had known you didn’t have a BD player I would have hooked you up with a link today from Redtag.com/Ubid.com for refurbed Sony BD player for $69 (with Internet for Netflix/Blockbuster)! I was that close to getting it and I don’t even need another BD player. I’ll keep an eye out for good deals like this for you. Thank you — I will happily take any suggestions from you! 🙂 While I will need to buy a Region Free BD player for some of my series, at this point, I would love to be able to watch ANY of my BD items! Yeah, the Netflix is a big thing for a player for us — I watch on my MacBook, since my OLD TV won’t let me hook into the sound (well, yes, but the hubby has to do it — he has some system set up for surround sound, so can’t just use the tri-color plugs…).